Joakim Noah in Wednesday’s 105-94 victory over the Detroit Pistons had his second triple-double this week and third of the season, more than LeBron James and Kevin Durant combined. Jimmy Butler had 18 points and a game-high 12 rebounds as the Bulls overwhelmed one of the league’s top rebounding teams on the boards, 43-32. Taj Gibson came off the bench with 22 points, making 11 of 16 shots turning around a 12-point second quarter deficit with 14 points in the quarter, dominating Pistons star Josh Smith inside. Yes, just another ho hum night for the 34-27 Bulls with their 10th win in their last 12 games and 11 of 14. It’s the stuff guys say all the time, but these Bulls do seem to have something going with also their sixth road win in their last nine. Though there was a bit of an uneasy focus as well on Noah after the game as he wore a splint on his right thumb. Noah is known for his eclectic taste in fashion, but this was hardly his choice accoutrement. Noah apparently sustained a sprained thumb, though he diminished its severity and the Bulls also seemed to ease concerns. Noah did have surgery on his right thumb in 2010 and missed two months. But this seemed an unrelated issue. Noah certainly was all right once again with 10 points, 11 rebounds and 11 assists, becoming the first center since David Robinson 20 years ago to have three triple-doubles with assists in a season. Noah along with Gibson and Carlos Boozer, the latter with 10 points and five rebounds in 24 minutes, did strong work in controlling the Pistons big front line as none had double figures in rebounds. Greg Monroe led the fading Pistons (21-29 under Mo Cheeks and 3-8 under their current coach) with 27 points. But their shot choices were brutal as Smith was six of 21 and Will Bynum off the bench was one of 11. The Bulls overall were sizzling at 53.8 percent from the field and at least halved their turnover total to 14 after the aberrant outing in Brooklyn Monday. And then there was Noah again with this remarkable run of all around play that has national commentators discussing him as a potential MVP candidate. Two months ago there were doubts he’d even make the All-Star team as a reserve. After the game on the NBA TV news wrapup show they were discussing Noah as a certain top 10 player in the NBA. So it was Noah when it most mattered with he and Augustin breaking open a close game in which the Bulls led 71-70 entering the fourth quarter. First it was Noah finding Augustin on a slick cut for a score to open the fourth that began an 18-4 run in the first five minutes and culminated with a Noah pass for an Augustin three that broke open the game and gave the Bulls an 89-74 lead with a bit more than six minutes remaining. 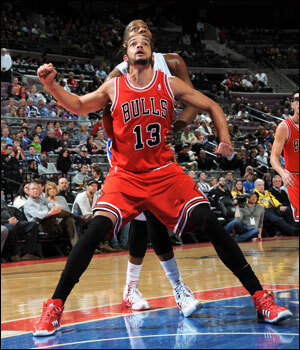 And there was more to come with Noah on the following Bulls possession after an Andre Drummond score. Noah faked a pass on a drive a la Magic Johnson and then finished for layup and foul. That started a run of six straight Noah points (to make it 95-80 with 3:39 left) that included a 19-foot jumper. Noah would have eight points, five assists and three rebounds in the fourth quarter while Augustin had 14 points, including working himself to the free throw line for five attempts, as many as the entire Pistons team. 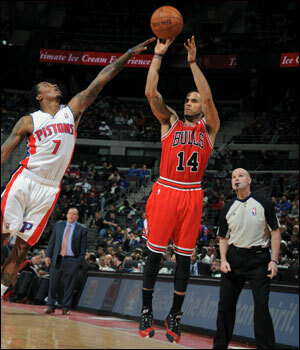 This comes after Augustin had 21 fourth quarter points in Sunday’s win over the Knicks. Funny where you might find the clutch players. Again, the Bulls returned to being the aggressors and the finishers, shooting 66.7 percent in the fourth quarter even as they missed five of six three pointers. That was in large part due to Noah’s uncanny passing that set up so many easy scores. “He’s been on an incredible roll for a long time,” Thibodeau said of Noah. “He’s patient. He sizes things up, keeps working, and all of a sudden you’ll see him get four or five rebounds in a row. You’ll see him run the floor. I think he’s getting comfortable being the first big down now. We’re getting good movement off his post up. He’s doing a lot of different things for us. It’s huge. The rebounding, the defense, the passing, his points; we need his points. If people are going to sit on his pass, he’s got to score. And I think he’s showing that. It certainly is an imperfect Bulls team and despite its toughness, somewhat fragile as Thibodeau remains basically with a seven player rotation. But the Pistons essentially played seven as well. Later in the season, many teams cut their rotations. And despite 46 minutes played, Butler added three steals to his game high rebounding in another ironman effort reminiscent of his playoff games last season. Still, it’s generally always a struggle for the Bulls as after a 7-2 start, the Bulls had trouble controlling Monroe when Noah went out in the first quarter and fell behind 25-19 after one. Though there was a good indication of how well Noah sees the court on one play as Butler hustled out with a rebound and was driving toward the paint. Hinrich was on the right side open and signaling for the ball. Butler didn’t see him, though Noah trailing the play did and was yelling to Butler to get Hinrich the ball. The ball finally found its way back to Noah, who then searched out Hinrich, who was covered by then. But with the defense shifting toward Hinrich, Boozer sprung open on the opposite side and Noah quickly went to him instead for a score. With Noah still sitting to open the second quarter as Thibodeau is monitoring his minutes more this season, the Pistons opened the second quarter with a 6-0 run to get that 31-19 lead. That’s when Gibson went to work and rallied the Bulls back pretty much on his own with a post game basically no one ever saw before this season. Gibson’s balance and moves are impressive for someone who never truly had a sophisticated post move before. But he repeatedly backed in Smith, spun around for scores, stepped out for jumpers and carried the Bulls back with Butler and Augustin combining for a poster lob dunk play in the middle of it all and the Bulls with a 52-47 halftime lead. The Nets Monday did the best job anyone had on Noah lately, though the Bulls were not the same energetic team that night. The book on Noah generally says to lay off and invite him to shoot jumpers. Because they spin sideways teams can’t seem to understand he can make them. But by playing off Noah like that, it opens up the passing lanes for his clever high post game. The Nets did the opposite and swarmed Noah, playing up close and frustrating his passing. Though a few times Drummond came up on Noah and Noah blew by for scores. So Noah is adjusting to various tactics. Though it did seem curious to have the less mobile Drummond on Noah, who plays outside. 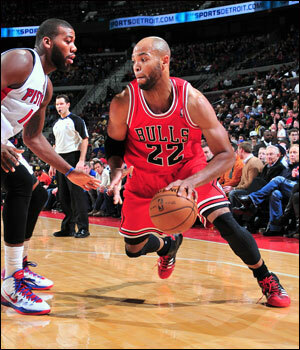 The Bulls had Boozer play the offensively weaker Drummond, and the Bulls won that matchup as well. The Pistons did get back in it during the third quarter even with Smith missing eight of 10 shots, most long jump shots with little ball movement. Still, Detroit closed within 71-70 after three. But after that Noah to Augustin start, Augustin put in an off balance, duck in 15 foot banker as the shot clock expired, Noah tipped in an Augustin miss and the hustling Butler turned another of his steals (10 in the last three games) into his own breakaway score before Mike Dunleavy made a rolling sky hook that reportedly made Kareem’s knees buckle. Noah found a cutting Butler for a slam dunk before that Augustin three to make it 89-74, and you almost could see the Pistons applauding as polite spectators should.